We'll discuss the refrigeration cycle using this cycle diagram. Feel free to copy this refrigeration cycle diagram and print it out. Component #1 is the compressor. It takes refrigerant vapor in from the low pressure side of the circuit, and discharges it at a much higher pressure into the high pressure side of the circuit. The compressor is the heart of the system; it keeps the refrigerant flowing through the system at specific rates of flow, and at specific pressures. And the operating pressures will depend on the refrigerant being used and the desired evaporator temperature. 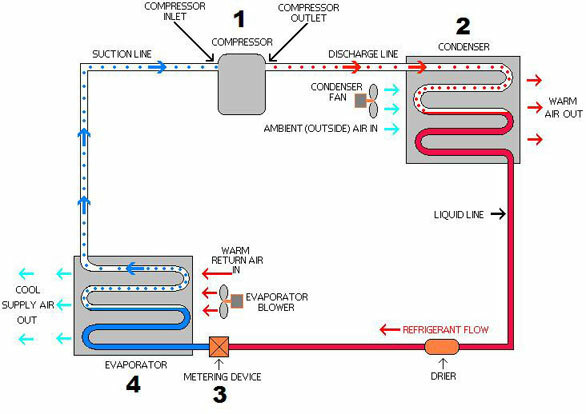 Component #2 in this refrigeration cycle diagram is the condenser. The red dots inside the piping represent discharge vapor. The solid red color represents high pressure liquid refrigerant. Most air cooled refrigeration systems are designed so that the refrigerant will condense at a temperature about 25 to 30 degrees above the ambient air temperature around the condenser. Most water cooled systems are designed for 75° to 95° entering condenser water temperature, with 85° being the design temperature. With water cooled condensers, refrigerant should condense at a temperature about 10° above leaving condensing water temperature, or 20° above entering condenser water temperature. When the hot refrigerant vapor discharged from the compressor travels through the condenser, the cool air or water flowing through the condenser coil absorbs enough heat from the vapor to cause it to condense. If the outside air temperature is 80°, an air cooled system is designed so that the temperature of the refrigerant, right at the point where it first condenses, will be about 105° to 115°. If the entering condenser water temperature is 85°, a water cooled system is designed so that the temperature of the refrigerant, right at the point where it first condenses, will be about 105°. Why do we want the refrigerant to condense at this relatively high temperature? And cause the refrigerant to condense. At this stage in the refrigeration cycle, high pressure liquid refrigerant will flow down the liquid line, through a filter drier that is designed to prevent contaminants from flowing through the system, and on to the metering device. And is designed to maintain a specific rate of flow of refrigerant into the low side of the system. An incorrect quantity of refrigerant will flow into the evaporator. When the high pressure liquid refrigerant passes through the metering device, its pressure will drop to a low pressure that will be equivalent to about 10° to 15° below the design temperature of the evaporator. And it wouldn't be too inaccurate to imagine it acting like warm soda when you shake the bottle and pop the top off. And remember, it's at a low pressure, so for a freezer it would be boiling at about -10° to -15°, and for a medium temperature refrigerator it would be boiling at about 25°. And that brings us to the evaporator, component #4 in the refrigeration cycle diagram. There will be relatively warm air (or water, if the unit is an ice machine) flowing over the evaporator coil. The refrigeration system is designed so that the refrigerant will evaporate in the evaporator at a temperature that's about 10° to 15° below the temperature setting if it's a refrigerator or freezer, and the temperature will drop to around 0° in the evaporator of an ice machine or ice cream machine. The system is designed so that the heat in the relatively warm air, water or ice cream mix flowing over the evaporator will move into the cold evaporating refrigerant. This process will continue to cool the air, water, or ice cream mix that's flowing over the evaporator until it reaches the design set point or thermostat setting. So, when you turn on the refrigerator, freezer, ice machine or ice cream machine, the system is designed so that the evaporator will stay colder than whatever it's cooling, and will continuously remove heat from it and cool it. I hope this page has helped you understand the refrigeration cycle a little more clearly; and please, feel free to contact us with any specific HVAC questions you might have, including questions about refrigeration on Guam, or air conditioning on Guam. Return from Refrigeration Cycle to the Air Conditioning and Refrigeration Guide home page.